Whether you’re in the market for a new roof or your current roof needs repairing, finding a professional Phoenix roofing contractor who is trustworthy and provides quality work can be a daunting task. If you’re not a roofer yourself, or an expert in all things roofing, knowing what to look for in a contractor can be tricky. Here in Arizona, there are more than a few roofing companies to choose from, but how do you know that you’ve hired the right roofing contractor? Here are some factors to consider. How Passionate Are They About Their Work? Someone who has passion in their profession, and takes pride in their work, will have their commitment show through in several facets of their professional workings. They will make sure that every new roof installation meets or exceeds expectations, every roof repair is done with longevity in mind, and every client is treated with respect throughout the entire process. When you are shopping for a roofing contractor in Phoenix, everyone you come in contact with should be ready and willing to answer any questions you may have, or be able to put you in contact with someone in their company that can do so. The company’s willingness to communicate with you, and win your business says a lot about their level of passion and dedication to their work. Make sure that your roofing contractor has passion that you can feel and see in their work. You can tell a lot about business practices by the reputation they’ve earned, both in the professional community they’re in as well as with the public that they serve. There are websites where you can read reviews of past clients, you can ask friends and family members about their dealings with a company, and you can even call the company and ask them for professional references to check out yourself. You want to make sure that you’re getting a Phoenix roofer with a good reputation for quality work, timely completion, and longevity of the material they use. Sometimes, you will get a better price from a roofing contractor who doesn’t have their work up to par, and could end up costing you a lot more than the original roof repair or new roof installation cost in the first place. Making sure that the price and reputation are both satisfactory is a big deal. What Is The Quality Of Their Work? When it comes down to it, the quality of the work done on your roof is the most important factor. Quality involves the materials used, the aesthetics at completion, and the length of time the work holds up in relation to the life expectancy quoted. Sometimes, a roof can be aesthetically pleasing from a distance, but once you get to details, they can be lacking. Having a roofing contractor who will give you the looks and the function is incredibly important. There are several different styles of roof, and a quality professional should have the knowledge and skill to provide quality workmanship for each type and style they are presented with. Asking for examples, references to past work done, and a professional portfolio are a few ways you can check the quality of their work yourself. Referring back to the company’s reputation for quality, and checking their professional references for recommendations or criticisms is a great way to gauge the quality of the roofing contractor’s work if you are not a roofer yourself. Searching for a professional roofing contractor near Phoenix that has a great reputation, and provides quality work that shows the pride they have in their work can be a chore, but it doesn’t have to be. 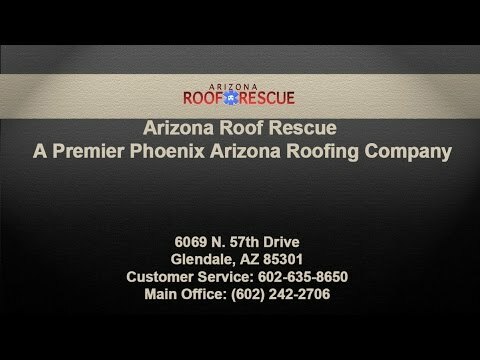 Arizona Roof Rescue has over 20 years of roofing experience here in the Valley. We are a full service roofing company that can help with anything from a new roof installation to a roof repair and everything in between. You know that when we put our name on a job, the pride we take in our work is unmistakable. We hope that you will give us a call and allow us to show you why we have the reputation for quality that we do. Give us a call today at 602-242-2706.